This one is the ram in the bush, that Avraham found to sacrifice instead of Yitzchak (Issac). Here's a shot of Gretta explaining the next cake to me. 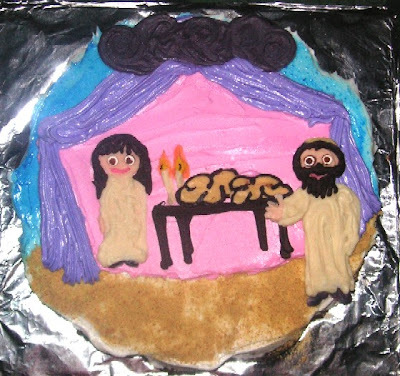 This one is Avraham and Sarah in their tent, offering hospitality. Sarah stayed in the tent, and Avraham rushed out to greet guests. 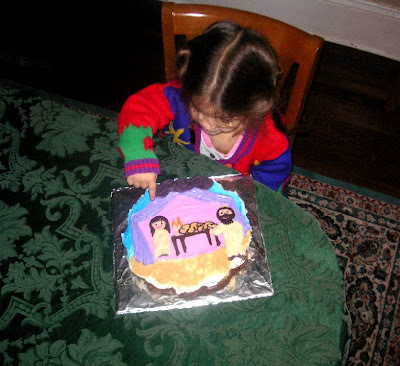 According to the Midrash, when Sarah was alive (and then later again when Rivka moved into the tent) her Shabbat candles burned all week long, her challah didn't go stale all week, and G-d's presence hung over her tent in the form of a cloud. Here's a bit about Parshat Vayera from Rabbi Ciner in 5758/1997 that I enjoyed. Those are beautiful cakes ! Parshat haShavuah cakes! I LOVE it! 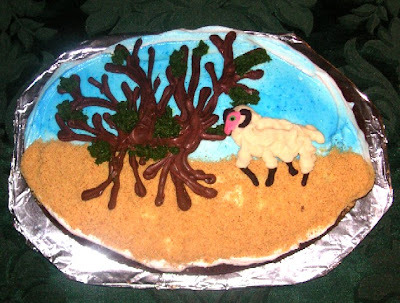 I'm looking around for ideas for Lecha Lecha, and I stumbled on your pretty post for next week's parsha!